OnePlus is yet to announced its next OnePlus device, which is most likely to be the new OnePlus 7. However, the rumor mill has already started creating so hype like always about the new OnePlus device. In addition to this, a new image has now been leaked over the internet that allegedly appears to show OnePlus’s next smartphone, most likely the first 5G OnePlus aka OnePlus 7 smartphone. 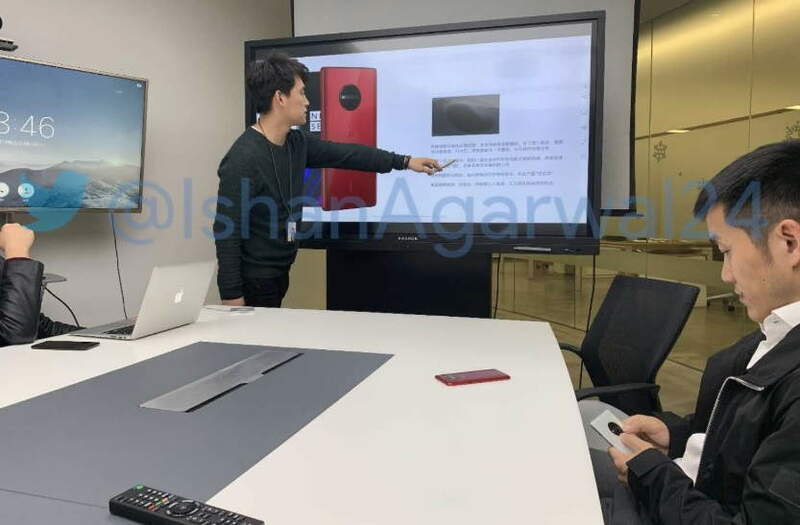 The image shows, which appears to be a meeting room with three people including Pete Lau, Co-Founder of the OnePlus with the new OnePlus device. The device, however, seems to be a prototype of the upcoming OnePlus device and also don’t confirms that the appeared device is upcoming OnePlus 7 or any other device which OnePlus maybe working on silently. The image as first spotted by serial leaker Ishan Agarwal on Twitter didn’t reveal much about the device but only giving us the first glimpse of the prototype that how the upcoming OnePlus device could actually look like. However, what we are sure about the upcoming OnePlus device is that the device would be the first OnePlus smartphone to come with 5G network support, other than this, we are not sure about anything else about the device as of now.